SuperKids Software Review of DreamBox Learning K-2 Math. DreamBox Learning K-2 Math is a web-based, self-paced, adaptive, interactive math education program, for young students. This online program incorporates up to 350 lessons for students, covering the kindergarten through second grade math curriculum. Available on a subscription basis, the program adapts to the individual user, monitoring not only right and wrong answers, but also the time the user takes for each problem. Wrong answers, or slow answers generate more practice on a given topic; quick, correct answers allow the user to jump ahead. After signing in, the user is allowed to pick an avatar - their own personal character, from a set of more than three dozen. The character choices vary in appearance, but have no impact on program play. The character then is introduced to the location options on the home screen map. Most of the action (and education) take place in the Adventure Park, where users go to find and collect tokens and Adventure Friends that they can store in My House, for later use in the Carnival. DreamBox Learning K-2 Math starts with math basics: counting, ordering, and comparing, then moves on to addition and subtraction, and various strategies for mental math. Correct answers are given postive feedback -- "good job!" or "right on!" ring out in the narrator's cheerful voice. Incorrect answers are sometimes followed by a gentle "try again" suggestion, other times by a hint, or finally, "come back and try this again later". One of the best features of DreamBox Learning K-2 Math, is the individual progress tracking and reporting available either by logging on, or in reports that can be emailed directly to the parent or teacher. DreamBox Learning K-2 Math follows a fairly typical model of drill and reward, in a quasi-exploration framework. The user is presented with a challenge where a set of objects must be collected, and rewards earned. The rewards can later be exchanged for access to games in the program. For example, in one section of K-2 Math, the user is confronted with a baby dinosaur trapped in a tar pit. The professor tasks the user with collecting rocks, logs, vines, a dino egg shell, and his tool box, to help construct a crane to lift the dinosaur to safety. Finding these objects requires the user to work through a succession of math exercises, ranging from counting objects, to correctly arraying numbers on a number line, to finding missing addends in a simple equation. Although a proven model for engaging young students, the web-based program is graphically constrained compared to other programs that run directly on a user's computer. Graphics are cute and appealing, but animation is limited. Reward tokens can be used in the Carnival to play a selection of simple games. Examples range from using the mouse cursor to pop balloons, to a ring toss-like pinball game, to a sticker game. DreamBox Learning K-2 Math is simple to set-up and use, since there is no software to install; the user merely needs to login to the DreamBox website. Our young review tester was, however, stymied at several points in the program, where he didn't know what was being asked, and the otherwise excellent context-sensitive instructions failed to help. For example, in a flashcard problem where the program is looking for a missing addend, the instructions merely stated, 'find the hidden number', rather than 'find the numbers that add up to the number on top'. Similarly, when asked to place a pair of numbers on a number line, the concept of a number line was not first explained. DreamBox Learning K-2 Math is an impressive example of the potential for computer-based instruction. 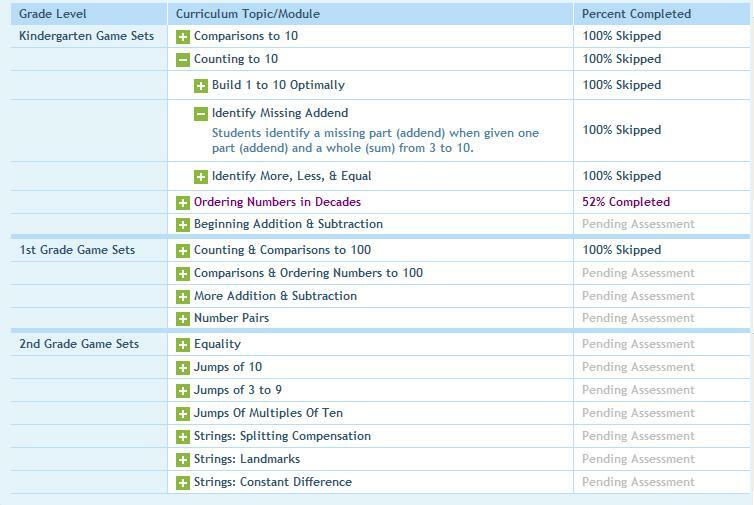 The adaptive learning engine in K-2 Math demonstrates how a program can adapt to the needs of the learner, and present appropriate material until the subject is mastered. Be aware, however, that most of the educational content is presented in a practice or drill format, with progressively larger numbers, rather than in a teaching format, where concepts are first explained, then practiced. K-2 Math would be appropriate for extra practice at home or school, or as the basis for a homeschooling class. See SuperKids' comparisons with other Math software titles, and the Buyers Guide for current price of the product. Mouse (touch pads do work, but are more difficult for most students). Minimum display resolution of 1024x768. The computer must have sound capability. Web browser. Windows supported web browsers are Internet Explorer 6 or 7, Firefox 1.x-3.x and Safari 3.x. Mac OS X (v 10.4, 10.5) supported web browsers are Firefox 2.x or 3.x and Safari 3.x. The web browser must allow session cookies (these are cookies that do not persist when the browser is shut down). Current version of the Flash player installed. Version 10 is required. High-speed internet access with a connection speed equivalent to a residential DSL line (1.5Mbps down/640kbps up). Any firewall or filtering software must allow HTTP access to http://dreambox.com and sub-domains of dreambox.com. Any firewall or filtering software must allow HTTP POST requests to http://dreambox.com and sub-domains of dreambox.com. Any parental control software installed on the computer must allow DreamBox to run. - Pentium 4 - 3GHz running Windows XP, with Firefox 3.5.2, with 1GB RAM on 1.5Mbps DSL line.